The MHL Consortium developed and published MHL Alt Mode for the superMHL™ and MHL® 1, 2 and 3 specifications to enable the delivery of audio, video, data, and power. Devices adopting MHL Alt Mode over the USB Type-C™ connector will be able to connect to more than 750 million MHL devices. This large and diverse ecosystem includes smartphones, tablets, TVs, monitors, automobile infotainment systems, AVRs, Blu-ray players, set-top boxes (STBs) and more. Since it’s a reversible connector, there’s no wrong way to plug-and-play! With MHL Alt Mode over USB Type-C, productivity just got more powerful. 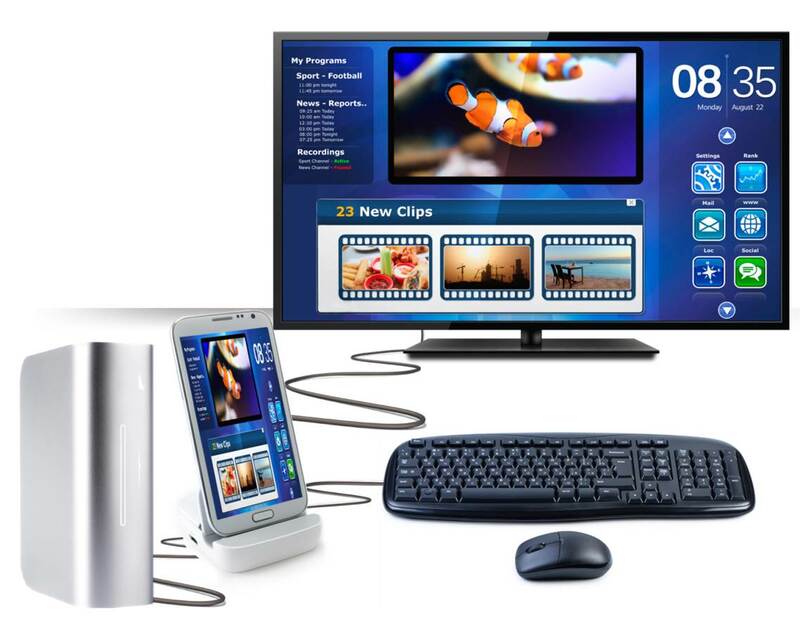 Dock a smartphone or tablet and then connect a keyboard, mouse and monitor to transform it into a powerful PC. Connect a mobile device to a laptop shell but have all of the processing power come from the device itself. With MHL, you can write emails, browse the Web, edit documents, and create presentations at any time, from any location. The possibilities are endless! Q: What is the MHL Alternate Mode (or Alt Mode) for USB Type-C? A: MHL Alternate Mode for USB Type-C enables devices to support simultaneous MHL® audio/video plus USB 2.0 and/or USB 3.1 Gen 1 or Gen 2 data and power charging over the USB Type-C™ connector. Q: Which organization developed and published MHL Alt Mode standard? A: The MHL Consortium developed and published MHL Alt Mode for the superMHL™ and MHL 1, 2 and 3 and specifications. MHL established a liaison with the USB 3.0 Promoters Group and USB-IF to obtain the official SVID and to ensure the specification was developed to conform to USB Type-C, USB Power Delivery and USB Billboard specifications. 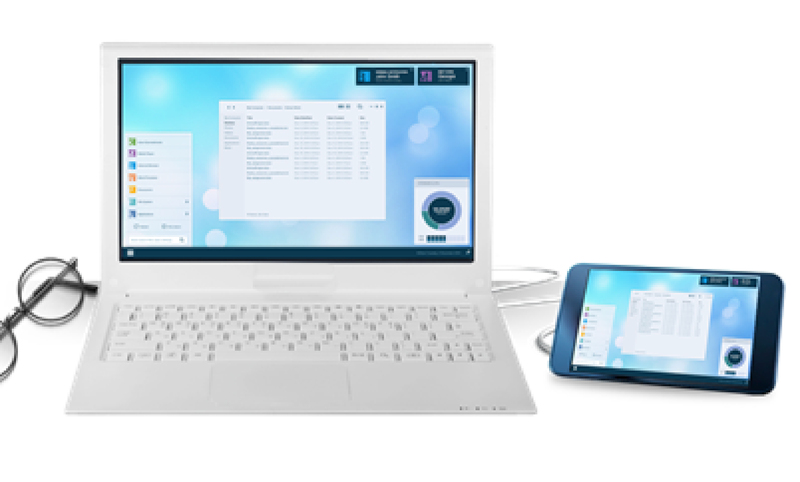 In addition, USB-IF will be working in conjunction with MHL, LLC to establish complementary certification and compliance programs to properly support USB Type-C hosts and devices that incorporate MHL Alt Mode. Q: What type of products will use this standard? 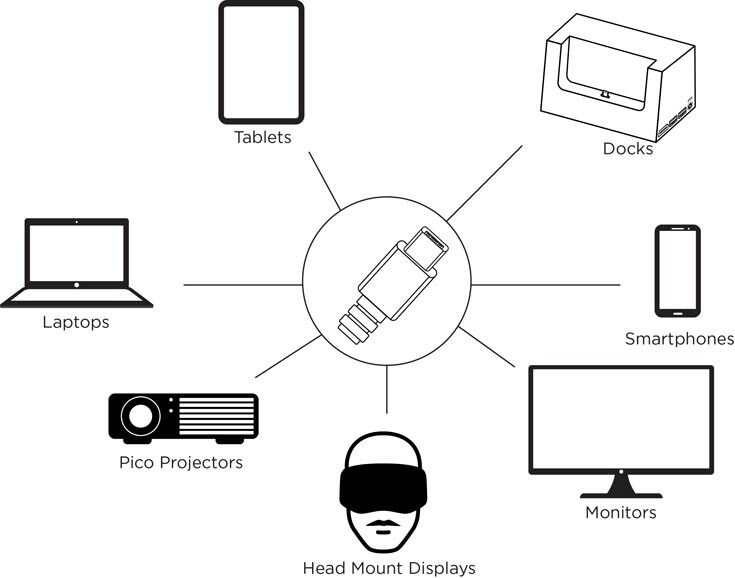 A: The USB Type-C connector is gaining interest for use in many types of devices such as smartphones, tablets, notebooks, docks, monitors, chargers, Pico projectors and head mount displays/virtual reality goggles. By using the USB Type-C cable and connector, these products can run concurrent MHL audio/video, USB 2.0 and/or USB 3.1 Gen 1 or Gen 2, and power charging if the product supports the MHL Alternate Mode. Q: What user benefits are derived from MHL Alt Mode on USB Type-C? A: A single, small form factor connector that simultaneously delivers audio, video, data and power is ideal for many devices. MHL Alt Mode over USB Type-C enables MHL video up to 8K and audio (such as Dolby Atmos®, Dolby Digital, DTS:X™, etc.) concurrently with USB 2.0 and/or USB 3.1 Gen 1 or Gen 2 data. Devices such as smartphones, tablets and notebooks will also be charged while connected to larger displays such as TVs, monitors, projectors and car infotainment systems. Q: How will I know if the Type-C connector on my device supports MHL? A: USB-IF has developed Logo Guidelines for USB Type-C Ports on Host and Devices that support Alternate Modes. OEMs that are manufacturing products should reference these guidelines and apply the appropriate logos to indicate if the MHL Alternate Mode is supported by a device. These guidelines can be found in the USB-IF Trademark License Agreement and USB Logo Usage Guidelines document published by USB-IF and available here: http://www.usb.org/developers. Q: Can devices such as smartphones and tablets with MHL Alt Mode connect to existing MHL TVs, monitors, projectors and car infotainment systems? A: Yes, MHL cables that support USB Type-C to HDMI® Type A can directly connect to a large ecosystem of MHL-enabled TVs, monitors, projectors, car infotainment systems, and other MHL sink devices. Q: Can devices with MHL Alt Mode connect to HDMI displays? A: Yes, devices supporting MHL Alt Mode over a USB Type-C connector can use an MHL-to-HDMI adapter to connect to HDMI displays. Since many TVs and monitors support MHL over the HDMI connector, a simple, thin MHL cable with USB Type-C connector on one end to HDMI Type A connector on the other end can be used. Q: How can MHL share the USB Type-C connector with the USB specifications? A: The USB Type-C and USB Power Delivery specifications include the provision for Alternate Modes that make allowances for repurposing designated pins on the USB Type-C Connector. The USB Power Delivery specification outlines the mechanisms for enabling Alternate Modes such as MHL. The MHL Alt Mode for the USB Type-C specification was released in 2014 and illustrates how MHL can share the USB Type-C connector. This specification is available for download to all MHL Adopters. Q: Will products using the MHL Alternate Mode be certified? A: Yes, MHL is working in conjunction with the USB-IF to establish complementary certification and compliance programs to properly support USB Type-C hosts and devices that incorporate MHL Alt Mode. Q: What are the benefits of MHL Alt Mode compared with DisplayPort Alt Mode? In contrast, MPEG-LA is administering a patent pool for DisplayPort and has publicly stated 20 cents per device royalty. Read more here: http://www.mpegla.com/main/programs/DisplayPort/Pages/Intro.aspx. Q: How does the MHL Alt Mode performance compare with DisplayPort Alt Mode? A: With MHL Alt Mode, the USB Type-C connector will be able to support four high speed lanes to deliver up to 8K @ 60fps and can also support 4K @ 60fps over a single lane. DisplayPort, in comparison, can only support 4K and 5K @ 60fps. In addition, superMHL devices can use DSC, which is a visually lossless compression to reduce the clock rate for a given resolution to minimize power consumption and EMI. Q. How would the end user experience be different using MHL Alt Mode versus DisplayPort Alt Mode? MHL Alt Mode supports Remote Control Protocol (RCP), meaning a user's existing TV remote can instantly be used to control the device while connected to the TV. With DisplayPort Alt Mode, it's not possible to control the source device with the TV's remote, so a user would have to get off the couch to manually control the connected device. With MHL, a user can easily use an inexpensive MHL cable to connect their mobile device to the display. With DisplayPort, the user would have to purchase and connect an expensive DisplayPort-to-HDMI adapter and HDMI cable. With this configuration, the phone/tablet with DisplayPort would drain the battery. In contrast, with an MHL connection, the device will be charged while connected to the display. Q: Will the MHL Alt Mode and DisplayPort Alt Mode use the same adapters to support HDMI, DVI and VGA? A: No, MHL Alt Mode protocol adapters will not work on systems that only support DisplayPort Alt Mode, and visa-versa. Such adapters should include labeling to identify MHL Alt Mode or DP Alt Mode support to avoid consumer confusion. MHL Alt Mode will support the use of protocol adapters to support HDMI, DVI, and VGA displays. Q: What products are expected to support MHL Alt Mode vs. DisplayPort Alt Mode and why would a product manufacturer choose MHL's solution over DisplayPort's? A. More than 750 million products have shipped with MHL. This large and growing ecosystem will be compatible with emerging products supporting MHL Alt Mode over USB Type-C. These MHL products include smartphones and tablets from leading brands throughout the world, TVs, projectors, monitors, Audio Video Receivers (AVRs), Blu-ray players, set-top boxes (STBs), media sticks, automotive infotainment systems, head mount displays and more. The MHL ecosystem includes IP cores from leading silicon vendors and has already been integrated into mobile, set top box, media stick and DTV SoCs. DisplayPort has only been adopted in the enterprise PC space and as those products transition to USB Type-C, may continue to use DisplayPort Alt Mode. However, it should be noted that DisplayPort has a significantly higher royalty than MHL that may be a limiting factor. MHL and the MHL logo are a trademarks, registered trademarks, or service marks of MHL, LLC in the United States and/or other countries. HDMI, the HDMI logo, and High-Definition Multimedia Interface are trademarks, registered trademarks, or service marks of HDMI Licensing, LLC in the United States and/or other countries. USB Type-C™ and USB-C™ are trademarks of USB Implementers Forum.All other trademarks, registered trademarks, or service marks are the property of their respective owners in the United States and/or other countries.